AKC Pembroke Welsh Corgi Puppies! Our dogs represent both U.S. and International Champion bloodlines, including 6 top sires of all time as well as working bloodlines proven and active in herding, agility and therapy. In 2011 one of our pups was featured on Denver's Fox News 31. He is a seizure alert dog, a priceless gift to his adoring owner. Our breeding stock is health screened and certifications are listed with each dog. We test and certify for OFA, CERF, DM, and Vwb. Our pups are professionally raised and handled daily by family, friends and visitors. They are well socialized here on our 40 acre ranch with plenty of room to romp. They are vaccinated, wormed at 2, 4, 6 and 8 weeks and paper trained when ready for adoption. Tails are docked tight to the body and dew claws are removed at their first vet appointment within a few days of birth. We feed premium, holistic dog food and don't cut corners when it comes to cost and care! We provide each of our puppy buyers with a puppy packet that includes valuable information on care, exercise, training, supplementing and more. We offer a basic obedience puppy program for our new puppy owners who live locally. Visitors are welcome! "Emma" is our farm work dog, loves to be involved. She is energetic, brave, very athletic and eager to please. Some of her babies are performing in dog agility events. here at Haystack Acres in 1999. "Wilma" is our farm lap dog. She is little miss "love bug". Quiet, reserved, very obedient and easy to train. Most of her pups take on her personality. Prevents breeding AKC registered litters and limits showing in some AKC approved events. Allows breeding of AKC registered litters and showing in approved AKC competition. Deposits of $400 are accepted for reservation of puppies. Purchasers are given the choice of litter in order of deposits received. See Puppy Deposit Contract for full terms. The Puppy Deposit Contract now has fields for you to type information into before printing. Some of the Haystack Corgi owners have put together Corgi play-dates or meet-ups at dog parks around the Denver area. Click here to see some of the tongue-wagging fun (owners were having fun too!) North Denver play-dates are happening every Saturday, 9am at the Louisiville dog park. Here is a link to Facebook for this. Also there are meet-ups in Littleton. 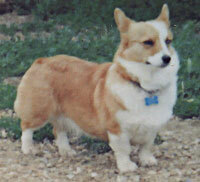 Here is a link to the Littleton Corgi Meetup web site for information. 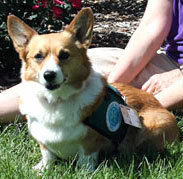 Check out our "Corgis in the Community" page here!